When I haven’t been drinking beer or blogging about beer, I’ve been writing and promoting my debut horror novel ‘Slasher Sam’ – which is out now on audiobook! Published by Darkwater Syndicate, ‘Slasher Sam’ follows the exploits of a horror-movie obsessed serial killer named Sam, who posts the details of their murder spree to a blog for the world to read, putting readers so close to the action that they’re practically in the splash zone when the blood and guts go flying. And is there ever blood – Sam’s a savvy killer, too well-versed in slasher films to make rookie mistakes, which is why the kill count scores well into the double digits. 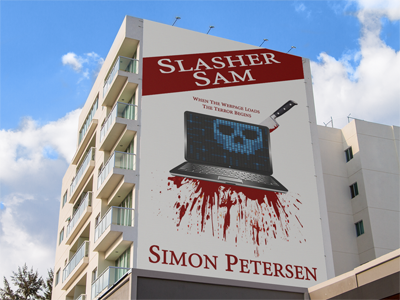 Slasher Sam is available now in print, ebook and audiobook formats from Amazon, as well as Barnes & Noble in the US, and Waterstones in the UK. Visit SlasherSam.com for more info.